António Rosa was born in Coimbra in 1977. Native of Vestiaria (Alcobaça), he studied at the Lisbon National Conservatory of Music, Almada Professional School of Music and he is a graduate of ESMAE under the guidance of professor António Saiote. He was awarded the Prize Foundation Engineer António de Almeida (best clarinet student of the year). António Rosa is a prize winner of Young Clarinetists Competition, Porto 2000, Marcos Romão dos Reis, Loures 2001, I.C.A., Stockholm (Sweden) 2002 and International Clarinet Competition of Montrov, Valencia (Spain) 2003. Founder of the Porto Clarinet Quartet, Horizontes Trio, Marchen Trio, he is soloist with the Oporto National Orchestra since 2002 and currently he is clarinet teacher at Oporto Superior School of Music and Performing Arts . In January 2007 and March 2012 he released his CD works – Projecto XXI – , with music by Contemporary Portuguese Composers for Clarinet and Piano, along with the pianist António Oliveira. In October 2007 they were awarded the Best Chamber Music Group prize at the International Music Festival of Lleida, Spain. He participated with the Projecto XXI at several shows in Portugal and Spain as well as in the ClarinetFests Vancouver 2007, Canada, and Kansas City 2008, USA. Entrepreneur by nature, António Rosa created the project “Tempos de Vanguarda”, a set of cultural events directed to music and arts in general, emphasizing live performances by high quality artists, educational projects and commission of new works to many living artists. 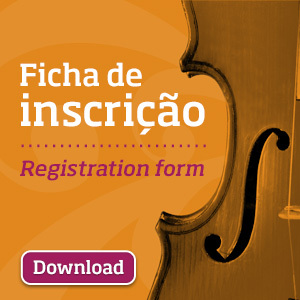 Since the first edition, António Rosa is the Mentor and Artistic Director of the International Chamber Music Competition “Cidade de Alcobaça”. Kika Materula started her musical studies in Maputo (Mozambique) at the age of 7 and later moved to the schools of Évora Professional Music, Lisbon Superior Music and Malmö Academy of Music (Sweden), where she completed her Postgraduate in the Class of Professor Bjorn Carl Nielsen. In 2001 she won the 16th edition of the Young Musicians Prize in the oboe category in Portugal. She currently performs as soloist at the Casa da Música Symphony Orchestra. Kika Materula is Artistic Director of the Xiquitsi/Classical Music Season in Maputo since its foundation, and in May 2016 she was awarded with the Order of Merit Medal by the President of the Portuguese Republic. Considered by international critics one of the most important percussionists and original musicians of the present time Pedro Carneiro plays, directs, composes and teaches. In his international solo career he has collaborated with orchestras such as: BBC National Orchestra of Wales, Vienna Chamber Orchestra and Los Angeles Philharmonic under the direction of maestros like Gustavo Dudamel, Oliver Knussen and Christian Lindberg. He is a guest professor at the Zeltzman Festival, directing at the Round Top Festival in Texas, USA. He is co-founder, artistic director and titular conductor of the Portuguese Chamber Orchestra (OCP), a project that was internationalized in 2009 which took the initiative to promote social projects such as the Young Portuguese Orchestra and Contact Notes. He received a scholarship from the Gulbenkian Foundation at the Guildhall School (London), in percussion and orchestra direction. Pursued the Emilio Pomàrico courses of direction at Accademia Internazionale della Musica of Milan. He received several awards, including the Gulbenkian Art Prize 2011. Magalhães has appeared as soloist and chamber collaborations across Europe, Brazil, China, Japan, Zimbabwe, Mozambique, South Africa and the US. As one half of the Schumann-Magalhães duo, better known as TwoPianists, he has also released a further four critically acclaimed CDs. This collaboration with his wife, Nina Schumann, has been compared to the duos of Ashkenazy-Previn and Argerich-Freire (American Record Guide). Magalhães is a co-founder of the independent label TwoPianists Records, which has been the recipient of both local and international accolades. He is a co-founder of the Stellenbosch International Chamber Music Festival, which has since 2004 become the premier classical music festival on African soil. He also co-founded the Stellenbosch International Piano Symposium. Magalhães was awarded a Doctorate in Music from the University of Cape Town in 2011, and holds a professorship at Stellenbosch University. He has also given master classes and lessons at New York’s Juilliard School and universities across Europe, Asia and the US. He has served in the jury of the prestigious Tchaikovsky International Piano Competition for Young Musicians (2012) amongst others. Magalhães is a Yamaha International Artist. Luís Tinoco studied at the Escola Superior de Música de Lisboa and at the Royal Academy of Music in London. He then completed a PhD at the University of York. Since 2000 he has worked as an author and producer of new music radio programmes for Antena 2 / RTP. For this same radio he is also the artistic director of the Young Musicians’ Prize & Festival. Tinoco also lectures Composition at the Escola Superior de Música in Lisbon. His catalogue includes various chamber, orchestral and stage works, and he is currently Associate Composer at Casa da Música [Season 2017] and Resident Composer at the National Opera House [Teatro Nacional de S. Carlos]. Tinoco’s music is published in the UK by the University of York Music Press, and is available on CD recordings by the Orquestra Gulbenkian (Naxos 8.572981), the Ensemble Lontano (Lorelt 121), and various chamber groups.